LEARN ABOUT PROJECT SERVE IN 3 MINUTES! Project Serve organizes and facilitates local and international service projects that educate & equip young people to love & serve God & others. THROUGH PRE-TRIP MEETINGS AND PRACTICAL VOLUNTEER OPPORTUNITIES, young people are exposed to the realities of poverty and injustice and invited to face these issues head on. We hope that through experiencing first-hand how God is working, they will be transformed and inspired to become a catalyst for change that reflects God’s heart and Jesus’ life in their own community and beyond. we host trips in Toronto, join us for oNE DAY, a WEEKEND, OR a FULL-WEEK TRIP! WE also TAKE TEAMS FROM THE GTA TO SERVE IN: Philadelphia, PA, BARAHONA, Dominican republic AND PALMA SORIANO, Cuba for one or two weeks. YOUR GROUP WILL STAY IN A LOCAL CHURCH OR WITH A MISSION PARTNER, AND WE’LL TAKE CARE OF FOOD, TRANSPORTATION, AND EVERYTHING IN BETWEEN. THIS ALLOWS PASTORS AND TEAM LEADERS TO SHARE IN THE EXPERIENCE ALONGSIDE THEIR YOUTH AND SPEND TIME BUILDING RELATIONSHIPS WITH THEM. DURING THE DAY, YOUR PROJECT SERVE TRIP LEADER WILL FACILITATE OPPORTUNITIES FOR YOUR GROUP TO SERVE ALONGSIDE LOCAL ORGANIZATIONS. THESE ORGANIZATIONS ARE ON THE FRONT LINES OF SERVING THE PEOPLE IN THEIR COMMUNITY. THESE OPPORTUNITIES COULD INCLUDE PREPARING AND SERVING FOOD AT A HOMELESS SHELTER, RUNNING children's programs, PARTICIPATING IN A BUILDING OR RENOVATION PROJECT OR SIMPLY LISTENING. EACH NIGHT YOUR TRIP LEADER WILL DEBRIEF WITH YOUR TEAM TO HELP THEM UNPACK AND REFLECT ON THE EXPERIENCES OF THE DAY. DURING YOUR TRIP WE ALSO HAVE SOME TIME FOR FUN AND TEAM BONDING AS YOU PARTICIPATE IN A LOCAL EXPERIENCE. IN THIS, WE HOPE THAT EACH YOUNG PERSON HAS THE OPPORTUNITY TO ENGAGE WITH A CULTURE OUTSIDE OF THEIR OWN COMMUNITY. The cost of your trip covers food, transportation, accommodations, street walk (in toronto), Project Serve staff and activities. LISTED BELOW ARE THE TYPICAL COSTS FOR A toronto TRIP, BUT COSTS MAY VARY DEPENDING ON YOUR GROUP AND ITS NEEDS. Before the trip even begins, Project Serve will run pre-trip meetings for your team. These meetings are used to educate the team on poverty and injustice issues; to help the team understand God’s heart for service through scripture; to build a sense of unity and belonging within the team, and to review final trip details. After the trip, Project Serve places a large emphasis on applying what they learned on their trip to their daily lives and how it can transform their relationships with their friends, family, school and community. These meetings focus on bridging the gap between mission trip and missional living. We want to inspire young people to become a redemptive presence in their community, and beyond. I have worked with Youth Unlimited for just over 12 years! (Hard to believe right?) I have gone from summer intern, to Launchee, launching my dream of having service trips that weren't just for Christian youth, to running Project Serve! I have a desire to see youth transformed through service project trips. I am grateful to have the opportunity to educate youth on issues of poverty and injustice and I love the moment when a young person's perspective shifts because of an experience or new knowledge. I have led countless Project Serve trips in Toronto, Philadelphia, Mexico, Costa Rica, and Cuba and have a Masters of Theological Studies in Missions and Counselling from Tyndale Seminary. When I'm not leading a Project Serve Trip you can find me with my husband, Murray chasing our adventurous preschooler and toddler around. " "I have worked for Youth Unlimited for 4 years, and I've been involved in youth ministry for over 6. While in university, I was captivated by this question: What would it look like for people to be 'on fire' for God? I became more aware of the brokenness in my city and I began a journey of discovering God's heart for the marginalized and our role in that. Project Serve is a perfect match for my heart for justice. I have been leading groups of youth on Project Serve trips in Toronto, learning more each day about the realities of homelessness and poverty, and wanting to share that knowledge with young people." "I have been a part of Project Serve for four years and I work as a summer intern when I'm home from school at Moody Bible Institute in Chiagao. Through going on Project Serve’s trips to Philadelphia as a youth, I became aware of the injustice happening worldwide. Those trips motivated me to become a part of Project Serve, to give others the same learning experience and inspire youth to impact the world around them. I'm currently going to school at Moody Bible Institute, majoring in Urban Ministries, to fully understand the dynamics of the realities in the city. I feel like God is leading me into mission work as He continues to open new opportunities of ministry." " I am a teacher for a private Christian school in Scarborough, and during my summers off, I'm a Project Serve Volunteer! I have volunteered on Project Serve trips to Mexico, Costa Rica, and Philadelphia, USA. I love teaching young people about God, faith and helping others. Have you ever wanted to make a difference in the world, but you didn’t know where to start? No matter how old you are, you and your friends have potential to make an impact in your community, city, country, and the world. A service project with Project Serve gives you the opportunity to uncover how you can change the world in a positive way! Project Serve helps you to become aware of the needs of others as you spend your days working alongside local organizations. This could mean picking up garbage, gardening, painting, serving or cooking food, leading recreational activities with children, sorting donations- basically anything that is of help to those we are serving. Some tasks may seem meaningful to you, while others may seem entirely insignificant. In either case, you will learn how your actions are impacting the community, and why your role matters. You will begin to understand poverty and injustice through firsthand experience. Given that you will be out of your normal cultural and social environment, you will likely encounter situations that you are not used to or are not comfortable with. These moments are not only usually the most memorable, but they often contribute the most to growth and learning. Keep in mind that while there may be times that you feel uncomfortable, we will never expose you to a situation in which your safety is compromised. These trips also offer you the opportunity to not only connect with new people but help strengthen the relationships within your team through shared experiences. You will be part of team meetings in the weeks before and after the trip, where discussion will revolve around issues relating to poverty, injustice, and the planning of your group's service project. You will learn how to take the knowledge and skills you've learned on the trip, and apply them to your own lives. You will learn how, through volunteering, you can continue serving and helping others in your everyday life. Overall these trips are a lot of fun and full of great experiences that you can be a part of! If you want your youth to grow in humility, learn how to have healthy relationships, have a rooted identity in Jesus, learn how to joyfully serve, and develop a clear purpose, a Project Serve trip is perfect for you! Your Project Serve Trip Leader organizes and builds your trip from the ground up, and works directly with the youth and the leaders. We create a budget for your team depending on the size of your group and the duration of the trip, and set up service opportunities. We provide the literature and materials for pre-trip meetings, debriefs during the trip, and a final debrief that is usually scheduled for a few weeks after the trip is done. If your group is within the Greater Toronto Area your Trip Leader will run all your pre-trip meetings, if you are from outside the GTA your Trip Leader will run at least one of the pre-trip meetings either in person or via skype (depending on your location). They will also run the post-trip debrief session. Nightly debriefs during the trip will be run by either the Trip Leader or Youth Leaders, depending on the size of the group. Meals, accommodations, activities, and transportation are covered under the budget unless otherwise specified. During the project, our primary function as Trip Leaders is to make sure your trip runs smoothly. We spend the majority of our time doing the legwork that would otherwise occupy the leaders. Our goal in serving you is to free up your time so that you can spend it with the youth. These trips are a great opportunity to build deeper relationships with your youth. There are so many opportunities during these trips to start meaningful conversations with your youth and to make sure they are getting the most out of their experience. We will take responsibility for errands and additional time-consuming tasks that would otherwise hinder your ability to best serve your youth. Project Serve is a Christian faith-based organization whose content and curriculum are primarily based on a Biblical, Christ-centred foundation. However, we believe strongly that youth from all backgrounds and religious affiliations will greatly benefit from their experience with us. Evangel Hall Mission is an inner-city mission that builds community with poor, homeless and socially isolated people in Toronto. Your role at Evangel Hall Mission will be to help the staff with what needs to be done in order for their ministry to run smoothly. This may involve food and clothing sorting, or the serving of meals to the guests. Matthew House warmly receives and assists refugee claimants from all nations. They welcome with God’s love by providing safe shelter, settlement assistance and bridges into the community. You will be serving at Matthew House by assisting with maintenance. These tasks might consist of housework, yard work, cleaning, or other household responsibilities. The Good Shepherd is known for its work with Toronto’s homeless and street-involved populations. It is a safe place where those in need can receive a hot meal, clean clothes, and a warm bed for the night all in an atmosphere of respect and dignity. You will support The Good Shepherd by lending a hand with laundry, bed-making, or preparing and serving meals. Staying true to its commitment to help rebuild the lives of abused women and children, Yellow Brick House provides free emergency shelter, counselling, and other supportive services. You will serve at Yellow Brick House by organizing donated items and cleaning recently vacated apartments to prepare for the next person or family to occupy the living space. The Canadian Red Cross improves the lives of vulnerable people by mobilizing the power of humanity in Canada and around the world. Red Cross includes many programs such as natural disaster relief, mobile food banks, family support teams, and many more. You will serve at Red Cross by sorting food donations, and preparing food packages to be sent out to those in need. Light Patrol is an outreach program that responds to the needs of Toronto’s homeless and street-involved youth. Light Patrol assists and guides these vulnerable young people, helping them transition away from the destructive elements of Toronto’s street life. Your role will be to help prepare for their nightly outreach by cooking soup in the kitchen or sorting donations. The Dale Ministries is a community that seeks to be welcoming to all, who are coming as they are. They create a safe place to ask hard questions, pray together, fall down, and get back up together by sharing meals and celebrating. Your main job at Dale Ministries is to be a friend to the people of the community, as you sit with them or maybe play a game of cards with them. St. Felix Centre is a non-profit community centre that is dedicated to helping individuals, families, and children experiencing challenges such as poverty, abuse, homelessness, mental illness, and addiction. Your role at St. Felix Centre will be to help prepare and serve a warm lunch and to lend a hand to the workers as they need it. St. Francis Table is a community restaurant that focuses on serving the people of Toronto in need of a meal. They aspire to maintain an atmosphere of dignity and respect for those they serve. Your role while serving at St. Francis Table is to prepare and serve food, and to lend a hand to the staff as they may need it. Where can my team go? If your team is from the Greater Toronto Area (GTA) you can come on a trip in downtown Toronto, or on one of our international trips to Philadelphia, Dominican Republic or Cuba. If you are from outside the GTA we would be happy to host you on a trip in downtown Toronto. Who can participate in a Project Serve trip? Project Serve’s participants range in age from 11-25 years old. We have organized youth group trips, family trips, junior high trips, young adult and leadership staff trips. What will my youth group learn from their experience with Project Serve? The youth will receive the opportunity to learn through the pre-trip meetings, the service trip itself and also post-trip meetings. During our pre-trip meetings the youth will be educated on poverty and injustices issues such as human trafficking, homelessness, and slavery. 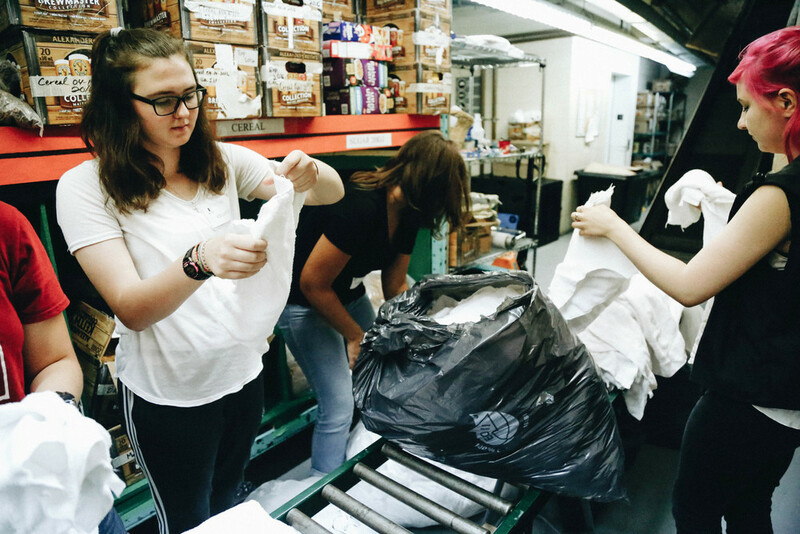 Throughout the service trip youth will learn, from hands-on experiences, the reality of poverty in the city and how to best assist the needs of others. Through debriefing and activities, youth will gain a better awareness of what their role is as a catalyst for change and how they can transform their own community. How can I be involved in the planning process? You can be as involved as you want to be. We have a standard trip but can also design a trip around your group’s specific goals and desires. Together we can create an experience that best fits your individual group of youth, to better benefit them and the people they are serving. Do you provide training before the trip? Yes! If your group is within the Greater Toronto Area (GTA), Project Serve runs pre-trip meetings with your youth before going on the trip. The number of pre-trip meetings is based on how long your trip is. These interactive meetings will allow your youth to engage with poverty and justice issues in a unique way and will also go over trip details with your team. If you are coming to Toronto from outside the GTA we will provide you with material to run these meetings for yourself and will do our best to be able to run one of these meetings for you. We are also happy to run a meeting specifically for the parents of the youth, to provide information about the trip and allow time for them to ask questions. How large of a group can we bring? Project Serve has the capacity to run a trip for a maximum of 20 youth plus leaders. Your team will be sleeping in Evangel Hall Mission, which is an inner-city mission that provides the homeless population with affordable housing, food, and many other services. We will be sleeping on the floor so it is important for everyone to pack sleeping bags and air mattresses! Your team will be sleeping at Old Pine Community Centre. This is a busy community centre in the heart of downtown Philly. We will also be sleeping on the floor there so pack your sleeping bags and air mattresses! Your team will be staying at a hotel that is safe and secure! No need to pack a sleeping bag this time! I’m a youth without a group. Can I go on a trip alone? Connect with us! From time to time we run trips for youth without a group of their own! Or if you are interested and belong to a youth group, refer your leaders or youth pastors to this site so they can sign your group up! © 2016 PROJECT SERVE A program of Youth Unlimited (Toronto YFC) All rights reserved.